Although the Pending Home Sales Index decreased for the second consecutive month in September to its second lowest reading in 2015, the PHSI has increased year-over-year for 13 consecutive months. 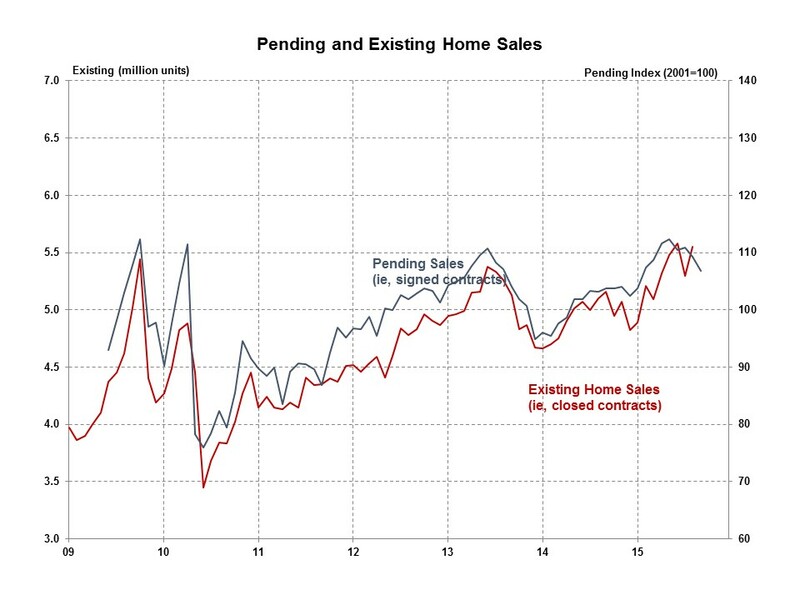 The Pending Home Sales Index (PHSI), a forward-looking indicator based on signed contracts reported by the National Association of Realtors (NAR), decreased 2.3% in September to 106.8 from a downwardly revised 109.3 in August. However, the PHSI is up 3.0% from September a year ago. The PHSI declined in all four regions in September, ranging from 0.2% in the West to 4.0% in the Northeast. Year- over-year, The West, Midwest and Northeast were up, ranging from 6.6% in the West to 3.9% in the Northeast. The South reported a small 0.1% decline from last September. Although the PHSI declined the past two months, existing sales increased in September. Coming just three days after a surprisingly weak new home sales report for September, NAR attributed the PHSI decline to the “stubbornly-low inventory.” However, disappointing job creation numbers in August and September suggest the decline is a demand-side issue. Despite these recent reports, builder confidence reached its highest level in ten years, painting the prospect of a good year for builders in 2016. It is unlikely that the real estate market will stabilize until something is done to bring back the first-time buyers who should be in the market. In a normal market, first-time buyers account for 40% of sales buy that number has been stuck under 30% for some time now. With interest rates going no where but up, someone had better figure out how to get them back soon or another significant downturn is ahead. My bet is that a lot of potential buyers are not in the market because of misinformation, something that is easily corrected.